The peaks are stunningly craggy. Like other Antarctica mountains, the Jagged Mountains attract adventure travelers, professional photographers, and skilled mountaineers. 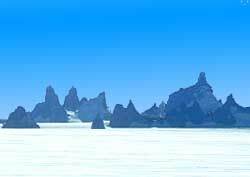 Some peaks - like those of the Jagged Mountains in Queen Maud's Land - sharply jut upwards out of the surrounding polar ice cap for heights surpassing those of the world's tallest buildings. Polar scientists call them nunataks. The most spectacular jagged peak is Rakeniven ("razor" in Norwegian). Its 600 meter (2000 foot) vertical rock wall wasn't scaled until 1996. The jagged Fenriskjefen ("Fenrisk's Jaw") peaks resemble the teeth of a ferocious wild animal (see photo). They were unknown until 1939 and are today a favorite among world class climbers. Note: In the photo you see only the jagged peaks of high mountains. The rest of them are hidden in the vast and thick continental icecap.